Once we have decided that Vietnam is our next missing destination planning the trip to Vietnam: which cities should visit?, what sites do not I lose me? What can we do in every city?, etc. Hanoi: The nation's capital and one of the main airports in the north of the country. Halong Bay: Quintessential tourist postcard Vietnam. Bay of calm waters dotted with karst formations, essential a cruise Halong Bay. Hue: Former imperial capital of Vietnam, in the center of the country. Residence of emperors and imperial cemetery. Hoi An: Atrasevado fishing village by a river, which together form the highlight Hue in central Vietnam. The Japanese covered bridge will love it! Ho Chi Minh City: The former Saigon, South Vietnam 's capital and largest city west of the country. Guinness Record inhabitants bikes. Noisy and exciting in equal measure. Mekong Delta: do not miss the opportunity to browse the famous Mekong delta. Rice paddies, jungle and memories of war. Sapa: the province of the mountains, in the North of Vietnam. If you like trekking, Sapa is your place. Tam Coc: known as Halong Bay on land. Dalat: the city of lovers, halfway between the Center and South of Vietnam. Water falls will delight of the traveller. Nha Trang: Following the path of Dalat, we find this beautiful coastal city. Cu Chi: Re-fuel from Ho Chi Minh city to plunge into the famous tunnels constructed during the Vietnam war. Phu Quoc: the largest island in Vietnam and diving paradise. Between Vietnam and Thailand. Temples of Angkor: in neighboring Cambodia, greater religious building erected by man. It takes 12 days (10 nights) to visit Vietnam since the plane from Spain is a 14-hour flight. 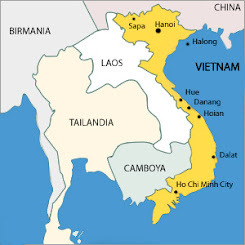 It is best to start at the north of Vietnam (Hanoi) and ending in the south (Ho Chi Minh City). Vietnam To navigate the faster the plane, the bus is cheaper. Alternatively we also train. Departure from Spain and arrival at Hanoi. Starting from Hanoi to Halong Bay and enjoy a cruise, visiting the floating village and the caves of the Bay (2 days). Return from Halong Bay Hanoi to Danang. Exit from Danang, crossing The pass of the clouds, go to Hue (2 days). Leave behind the city of Hue to visit Hoi An (2 days). Return to Da Nang to take a plane to Ho Chi Minh City. Visit Ho Chi Minh City and take advantage of to make some Shopping in Vietnam (2 days). Much to our regret, return back to Spain. Cities of Vietnam Guide to the major cities of Vietnam. Hanoi, Ho Chi Minh City, Hue, Hoi An, etc.